Христос Воскрес! Christ is risen! Khristos Voskress! That’s the salutation used at Russian Easter. Last Sunday I was up in Yorkshire celebrating the Western Easter with a slice of traditional English simnel cake. Today, I got to celebrate all over again. The flavours this time were Russian…and I’ve captured them all in a short, impromptu vlog (link at the bottom of this post). It all started when I checked twitter this morning – Orthodox Easter Sunday – and saw an announcement that there would be a blessing of Easter food – oсвящение пасхальной снеди – at London’s Russian Orthodox Cathedral of the Dormition of the Mother of God and All Saints. I’d been meaning to seek out this church for a long time. What better occasion to investigate than the most important day in the Church calendar? Plus, the promise of some Russian Easter food was too tempting to let pass. The heavens were open today, just like last Sunday. When I arrived, the first thing I noticed from under my umbrella were empty tables; somewhat different from the sunny scene in that tweet. I assumed I’d missed the ceremony or that it had been rained off. There was quite a throng inside, though. The building dates from the mid-nineteenth century. It was built as an Anglican church in the Lombard style (rather than the then popular Gothic). Since 1956 it’s been an Orthodox Church, though. Despite the western design, the interior is now home has the many icons with the candles you’d expect in an Orthodox place of worship. There were people coming and going, crossing themselves, placing candles and kissing the icons. 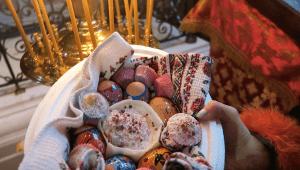 People had traditional Easter foods and decorated eggs with them. There was even a stall selling traditional Russian Easter cakes. The “kulich” is really a type of semi-sweet bread, with spices and raisins, very like Italian panettone. The name, I read,from Greek κόλλιξ (kollix) , and ultimately Hebrew: חלה‎ (challah) meaning a roll or loaf of bread. Some say it’s the shape of a priest’s hat. To others, it’s shaped like a traditional Orthodox Church, with the icing on top like snow on the onion dome. It was lovely to be transported to Russia for an hour or so. I was even spoken to quite naturally in Russian (and, of course, responded). Just as I was leaving, a priest announced that there would now be another blessing of the food. I hadn’t missed it after all. Such a Russian Easter food blessing was a new ceremony to me. What a splendid way to celebrate! How magical for the many children who were there, in particular. It doesn’t reflect well that I’ve been living in London for eight years and only now taken a brief part in the Russian Easter celebrations. It did feel a particularly timely gesture, though, given the current tensions between the Russian and British governments. One of the reasons for my tardiness, of course, is that there’s simply so much of everything going on in this multicultural metropolis. Even if you don’t live in such a large city, it’s always worth looking carefully for local events where the language you’re learning might be in use. Have you ever been pleasantly surprised with what you’ve found, whether at Easter or some other time of the year?